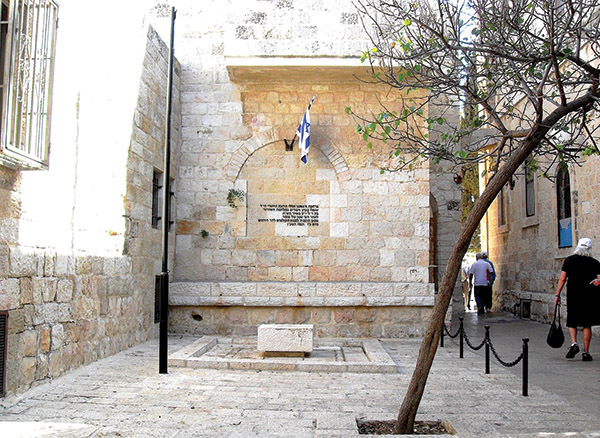 War memorial in Jerusalem’s Old City. I thoroughly enjoyed Steven Rosenberg’s essay on his recent trip to Israel (“Jerusalem Stone,” Jewish Journal, Jan. 24). I especially liked his “bravery” to have lunch in Mea She’arim – life in the 14th century! His article reminded me of a very similar experience last February. On a cool rainy afternoon, the sun suddenly came out as I approached the Kotel. A serious health problem only a few weeks before this visit to Israel caused an emotional reaction at the Wall. It resulted in a flood of tears, and heartfelt thanks to a higher authority for being there at all. An elderly, ultra-Orthodox rabbi put his hand on my shoulder and together we said Kaddish and the Shema. He asked me if I felt better – amazingly, I did! Never got his name or chance to stuff few shekels in his caftan. An angel? Now that I’ve been to Israel multiple times, coming back to Boston feels like visiting a vacation home or going back to school. No matter where I am in Israel – Hadera, Petah Tivka, Tel Aviv, Ramat Gan and Jerusalem – it feels like what “home” should really be. So, dear, editor, welcome to your “home away from home.” Your real home is Israel!